Mordian 7th Regiment: Mordian 7th - 5th Platoon Rough Riders complete! Happy Thanksgiving to those readers in the States today - among other things, I'm quite thankful for having the day off! Not having to go in to work at 6 in the morning, and having no other pressing demands (hooray! ), I was able to finish off the Rough Riders this morning! 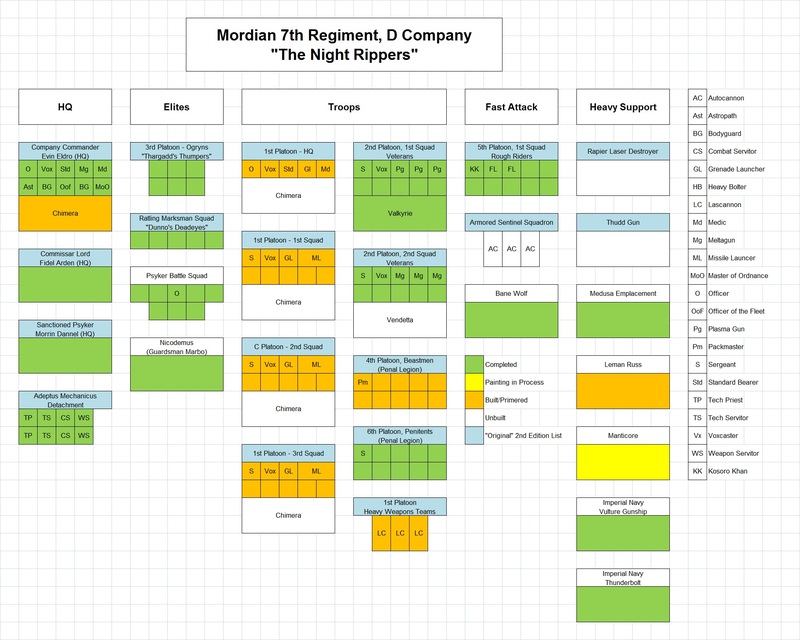 The Mordian 7th originally included an entire platoon of Rough Riders, let by Captain Hilts. While on extended recon patrol on Flotis III, the vast majority of the units horses were stolen (and presumably eaten) during a daring raid by Ork Kommandos. Captain Hilts led his men in a attempt to rendezvous with the rest of the regiment, afoot through Ork-held territory. Over two thirds of the unit were slain en-route by harassing attacks by Evil Sunz Speedfreeks, and Captain Hilts himself was savagely wounded after being set afire by an Ork Skorcha. Vowing to kill the Orks responsible and 'give them a taste of their own medicine', Captain Hilts requisitioned a number of bikes and several flamers, declaring he would forgo the stealth and range provided by riding horseback to the savagery and fire that he and his unit had experienced at the hands of the Orks. Captain Hilts generally hides his burned face behind a combination hood and rebreather, giving him a rather unsettling appearance. His hatred for Orks knows no bounds, though it's whispered among other units in the 7th that Hilts is every bit the savage now as any Ork, and that the 'breathing canisters' he uses contain not only oxygen, but Frenzon or some other combat drug.. I was worried that as all the bikes are identical, the whole unit would end up looking a bit monotonous, so I really tried to ensure the torso and arms for each model was significantly different. Overall I think it gives the unit a sense of motion and vibrancy. ...while the other half includes all the specialty models. A pair of flamers gives the unit a bit more anti-horde, while the other two models simply count as lance-armed guardsmen (well, discarding the remains of a lance in the case of the fellow on the far right). The masked man in the middle of the picture represents Captain Hilts, with his various tanks of combat drugs and an Ork Choppa. On the tabletop I plan to use him as a counts-as Mogul Kamir. Another unit complete, and the Mordian 7th Painting Chart is turning green! Not looking forward to tackling the 35 infantry models in the 1st platoon, though. Oof. They look fantastic! Nice to see rough riders with bikes, and the paint job is really good. I particularly like the command squad. Well done! Thanks very much! The bikes are available from Ramshackle Games, and were a piece of cake to build - all you need are Cadian heavy weapons team sprues, and they go together like a dream. Awesome! These are the coolest Cadian Roughriders I have ever seen! I appreciate it! It was definitely a fun unit to build, and paint! Hell yeah!Gotta love IG biker gangs!